The next RAB meeting is scheduled for May 22, 2019 at 6pm in the new Camp James A, Garfield headquarters building. Agenda TBD. The Restoration Advisory Board (RAB) has vacant general public positions. Click here to complete an interest survey or here to learn more about the RAB. Click here for RAB agendas, minutes and presentations. The most recent presentations are from the Nov. 07, 2018 RAB meeting. 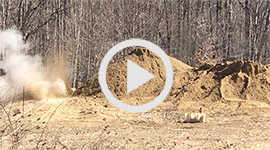 Click here to read the RVAAP Installation Action Plan for FY2016. Recent Documents Posted to RVAAP Website Apr. 9, 2019. Click here for a Record-Courier article on the Ohio National Guard training exercises at RVAAP, June 1980. Click here for a look at rare and historic Ravenna Ordnance Plant Newsletters from the 1940s. Read local news articles in RVAAP in the News. Be sure to check out our new Current Activities page for photos and info on the latest developments at RVAAP. The former Ravenna Army Ammunition Plant (RVAAP), now known as Camp James A. Garfield Joint Military Training Center (Camp James A. Garfield), produced ammunition for U.S. military during World War II, the Korean War, and the Vietnam conflict. 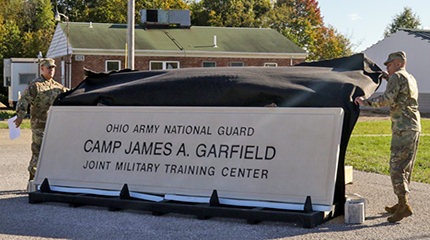 Administrative accountability for the entire 21,683-acre facility has been transferred to the United States Property and Fiscal Officer (USP&FO) for Ohio and subsequently licensed to the Ohio Army National Guard (OHARNG) for use as a military training site, Camp James A. Garfield. The RVAAP restoration program involves cleanup of former production/operational areas throughout the facility related to former activities conducted under the RVAAP. 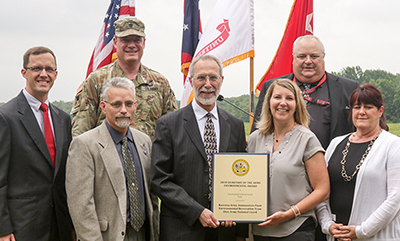 The RVAAP restoration program team receives the 2018 Secretary of the Army Environmental Restoration Team Award for the cleanup at RVAAP-05 Winklepeck Burning Grounds which ultimately helped to facilitate the construction of two military ranges at Camp Ravenna. Click for more info and photos. The links above and in the left margin of each page of this web site may be used to navigate from page to page. When you click on links to other web sites or PDF files, use the ‘Back’ browser button to return to the RVAAP Access web site.